How does HUB Connect integrate with Evolution? SwipeClock® integrates with Evolution HCM through our API. 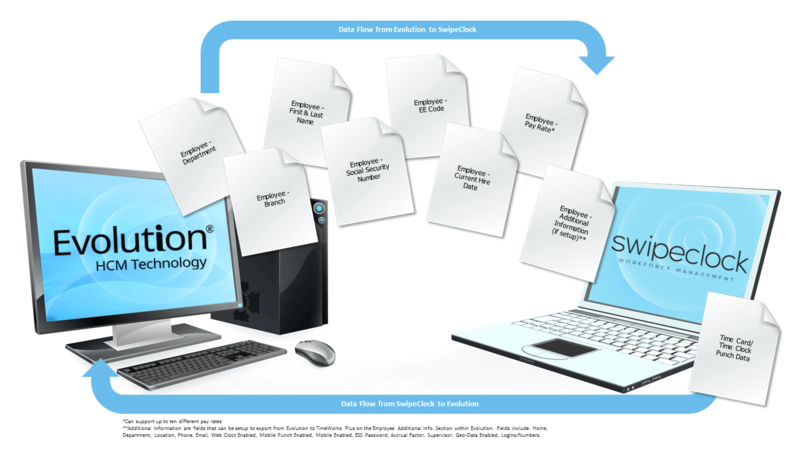 Employee information from within Evolution HCM is pushed to SwipeClock® so the two systems stay in sync. Please note that this integration is not designed to send information out of SwipeClock and into Evolution HCM, so Evolution HCM will need to be the primary system of record. Using the EvoTimeWorks Plus Bridge tool you can connect your clients to TimeWorksPlus in 4 easy steps. Push data directly out of Evolution’s Advanced HR and into Swipeclock’s TimeWorksPlus. Once the simple setup is complete data will sync automatically. No need to memorize multiple logins for Evolution Classic, Employee Portal, and TimeWorksPlus. How do I Enable the Evolution HCM Integration? Before Importing Punch data from SwipeClock into Evolution Classic, confirm that the E/D codes in Swipe Clock are mapped to the E/Ds used by the Company in Evolution Classic. For more information on how to do this please contact support. Go to Admin – Security – Users – Browse tab and select the user for whom you are enabling the right to sing into SwipeClock. Go to the Company – General – Company info – Payroll Products tab and enter the Swipe Clock Site Code for each Company. NOTE: It is crucial that the Evolution Classic user ID matches one of the three allowable user Logins for SwipeClock. The user in Evolution Classic must also be set up as a supervisor for the company in SwipeClock in order for the SSO to work. Go to the Self Serve tab and enter the Employee’s Employee Portal User Name and Password. NOTE: The Employee User Name must match one of the three allowable SwipeClock logins for that employee in order for the Employee to utilize the SSO feature. 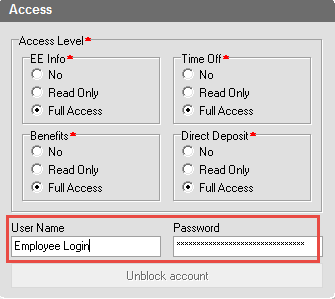 This information can be found in the Logins/Numbers field on the Employee setup screen in TimeWorks. The HR Administrator logs into the Evolution Advanced HR Admin site. Select the Service Bureau Parent Company. Click on the Service Bureau Settings button. Result: The system displays the Service Bureau Settings dialog box. The Evolution Advanced HR Administrative screen has been updated to accept the Service Bureau’s Master Partner credentials for SwipeClock. Enter the credentials and click Save. 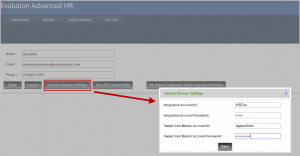 In the Company setup, in the T&A Provider field, select SwipeClock as the Time Provider and in the SwipeClock Site ID field, enter the SwipeClock ID number for the company. You can enable employees to be able to use both Evolution TOA and SwipeClock as the Time and Attendance providers in the Employee Portal. 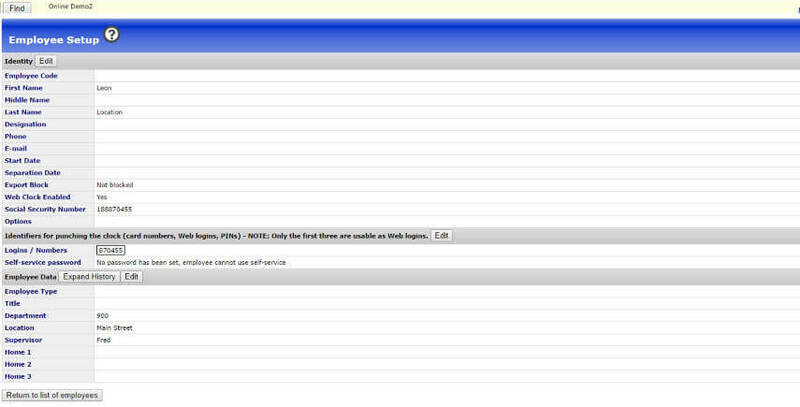 To do so, in the T&A Provider field, select Evolution & SwipeClock as shown below. Then any user going to the Port and clicking on the Time menu item can choose to either use Time Clock to punch in and out (SwipeClock) or for Time Off Requests (Evolution TOA). Users can select either. Navigate to the Employees – Employment tab, in the Employment Profile section, enter the Employee’s SwipeClock Login in the SwipeClock Pin/Login field. On the Portal View tab, select the Time check box option under Manage Roles, in the User Actions section. What Data Syncs between Evolution HCM and SwipeClock? Currently, the fields that sync between Evolution HCM and SwipeClock are listed in the screenshot above. Each field in Evolution HCM is listed along with its corresponding field within SwipeClock. Please keep in mind that for this integration to function, the Employee # field from Evolution HCM must match the “Employee Code” field within SwipeClock. 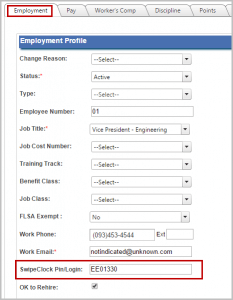 When a new employee is added into Evolution HCM please be sure to enter an Employee # and then this data will automatically be copied into SwipeClock when the employee is created there. 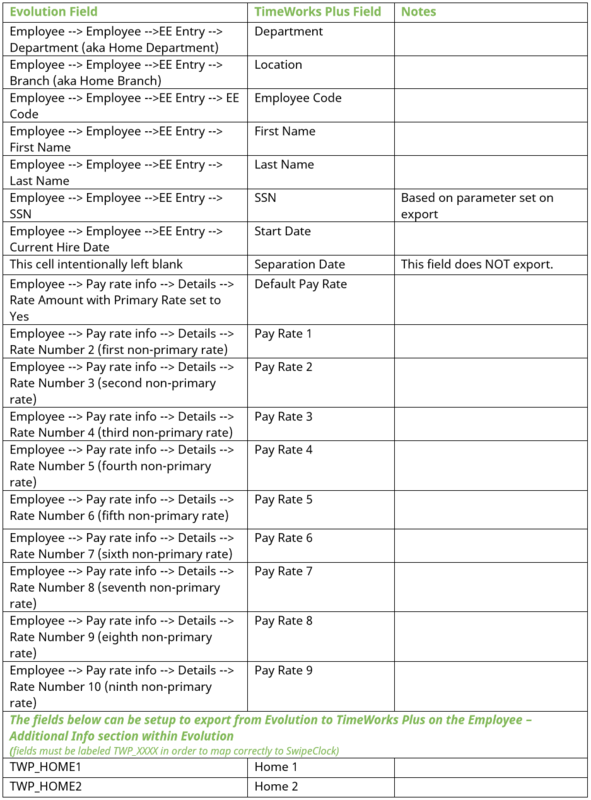 For updating existing employees (individuals existing already in both systems), if the Employee # and Employee Code field values do not match, it will result in duplicate entries being created within SwipeClock rather than existing data being updated. If you are an existing customer using this integration, please be aware that this integration is supported by Evolution HCM. For support regarding this integration, please contact Evolution HCM’s support team by email: support@evolutionhcm.com or by phone: 802-655-8347.